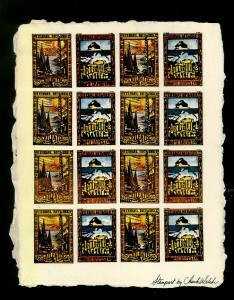 mail-interview with Chuck Welch – USA – iuoma.org – Interested in Mail-Art? 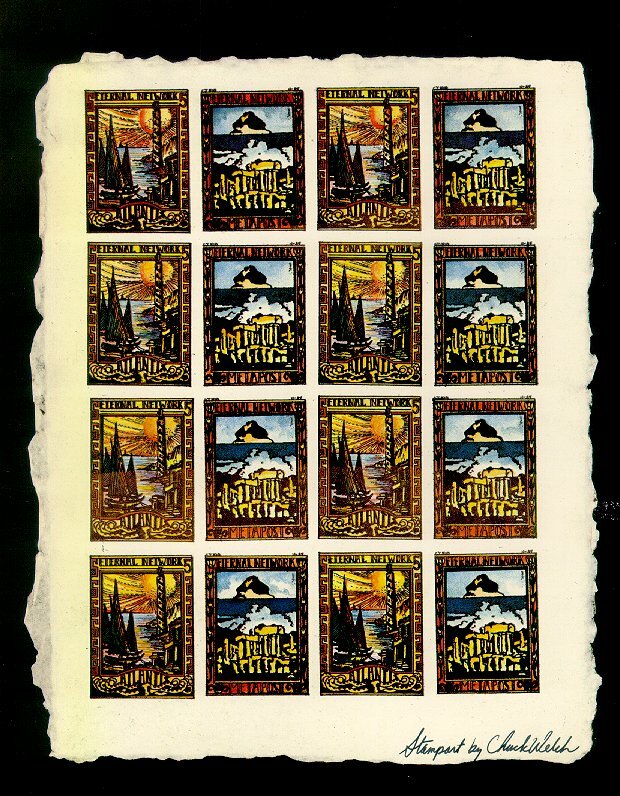 Chuck Welch has been a leading practitioner of mail art since 1978. His first book : “Networking Currents,” (1986) is a pioneering text about mail art subjects and issues. Last year he edited mail art’s first “ezine” “Netshaker On-Line”. Currently, Welch’s Eternal Network Mail Art Anthology is being published by University of Calgary Press. Copies are available. RJ :Welcome to this mail-interview. First let me ask you the traditional question. When did you get involved in the mail-art network? In a paragraph I can best describe how I’ve come full circle in my mail art interest. My initial attraction to mail art is difficult to analyze. I must be crazy because I spend about $1,600 each year on postage, enough to buy a new powerMac computer. Who says mail art isn’t expensive? But the mail art form fascinated me not because of the media, but because the message is what bonds us all in a global community. You see, mail art crosses borders between individuals, nations and cultures and makes your mailbox a central grounding space for the merging of art and life. At its best mail art is open, honest, democratic and collaborative. At its worst mail art is selfish, petty, factionalistic and clubish. Historically, mail art has traveled an intermedia course that diminished distances between communication forms as divergent and different as copier machines and telecommunication. As the international post declines will mail art too? I think not! The spirit of mail art is already transforming as the ethereal, eternal network in cyberspace-what I’ve termed in my 1991 telenetlink neologism, “emailart”. RJ :It seems that at the moment two networks, that have existed beside each other for many years, are gradually being influenced by each other. What can the Internet mean to mail-art and visa-versa? CW :I developed the idea of Telenetlink in 1991 to explore how the on line internet and mail art communities might interconnect. That process is still evolving primarily through my widespread distribution of contact lists, but if mail art is a house and internet is the street, both forms will link in private homes and public spaces. In North America even the homeless have access to Internet through countless public libraries. The story is quite different in Europe where governments and industries must decentralize to join Internet. This means letting go of control, de regulating authority. Some experts say Europe is four years behind North America in understanding the potential of internet and Japan is almost without a clue. An interesting historical link exists between the internet and mail art and that occurred when pioneering mail artists quit the mailstream in the mid 1970s and created the first on line artists networks. Today, there are thousands more on line artists in North America than there are mail artists. Both communities will become acquainted and merge through Telenetlink. Then we’ll begin to understand what both communities will become to one another. RJ :For me the internet with the E-mail and speed is still different compared to the mail art network because of the digital form. Digital art is just a fragment of the total art that is produced. Some say that the Internet is just another way of communication besides the traditional mail-,fax-, telex- and phone-networks. What is this potential of the internet in your eyes compared to the other networks I mentioned? CW:To network or knotwork, that is the question. The message (emailart) and messenger (networker) are the medium, not cyberspace or snail mail. The emailartist is an invisible messenger who breathes the ether of cyberspace. The aesthetic of form in cyberspace is formlessness. Form is fluxed forever: time, speed, and distance are distorted, fragmented, diffused, and shattered. And, as if this induced anxiety isn’t enough, we can expect our notions of a virtual reality will continually change as technology transforms the tools at hand. When you talk about cyberspace being primarily a digital experience, I would point out that Internet carries sounds, visual images, and motion through software like Macromind Director. Internet then, IS MAIL, IS FAX, IS TELEX, IS SOUND, IS MOTION, IS VISUAL IMAGE all wrapped together through the existing telephonic technology such as fiber optics. Is this better than what traditional mail art offers? It isn’t a question of what’s better. Perhaps it is a choice, or preference we make based on what we already know. Cyberspace isn’t paradise, but neither is mail art. Both have major pitfalls and both share problems of community, of censorship, of systems regulating, controlling, and centralizing authority. Mail art networkers have grappled with these issues long before cyberspace came along. How can our experiences help shape and form new communication spaces? I think mail artists have much to offer as does cyberspace. Both forms will merge in the streets of networking. This is the inevitable future of mail art, whether mail artists like it or not. RJ :One of the things you do on the internet is your magazine Netshaker, which I received through the net from you too. Does the concept from a e-zine differ a lot from the zines we know in mail-art? Does the e-zine bring new possiblities (or problems) besides the speed of sending? CW:If concept includes the objective of building on line communities, encouraging collaboration, debate, presenting projects, etc., then my “Netshaker On Line” is almost identical to the snail mail version of “Netshaker.”. But as a networking tool, “Netshaker On Line has a much greater potential for reaching an enormous international on line audience with speed and with little expense. In discussing “ezines” I want to clarify that this term is an invention of my own, an abbreviated form of “electronic zine.” Prior to “Netshaker On Line” there were no mail art zines on Internet, only formal “magazines” such as Art Com and Post Modern Culture. Part of the challenge of the Networker Telenetlink has been to lead the way in pointing out possibilities. The definition of mail art “ezines” will evolve as other mail artists experiment with the form. For now, it is important to start the idea of “ezines” moving. Now, I see that Mark Bloch and Guy Bleus have made their zines available over Internet. Vittore Baroni wrote last week that he would be going on line next Fall, so it is possible that his “Arte Postale” will go on line too. Ezines are primarily text based rather than visual, but this doesn’t mean I can’t replicate visual images as seen in mail art zines. Graphics can be scanned, compressed, and transmitted over internet by GIF, an acronym for Graphics Interchange Format. How can you move a graphic image over the network? Pictures can be shipped as ASCII text, but the recipient must have software on their own computer to put it in shape. Downloading visual images can be a boring, consuming process if you’ve got a slow modem, say 2,400 bps. rather than 19,000 bps. Plus visual images consume a lot of space on disks and computers. If your personal computer is directly linked to a mainframe, computer speed isn’t an issue. But quite a few artists like me are connected to mainframes with modems, and this is a problem because I can tie up my phone lines for one or two hours downloading a single photograph. These access problems will be solved as fiber optic technology evolves. I think it would be a mistake to think that the ezine should function in the fashion that hands on mail art zines do. Mail art zines combine sound, vision, and touch with tangible form. Even the smell of fresh off set print has an appealing sensation that is first hand, and not simulated. Remember, I am a papermaker, a craftsperson who likes to work by hand. It’s ludicrous to think of taking a computer monitor to bed like you can a mail art zine. Mail art zines appeal directly to our senses and there is nothing simulated or compromised in the interaction. So I think it would be foolish to expect the ezine to replicate this experience. But you must remember that mail art zines will not compete with the virtual reality of an electronic zine a magazine that can stimulate the senses with mixed media techniques combining sound, vision, and motion. I can present, for instance, an ezine snapshot to my readers of a group mail art portrait taken at Katz’s Deli in NYC. Readers can click any mail artist in the portrait and hear the actual voice of that person speaking. Or with buttons mixed with text, readers could click a button for a video clip of Carlo Pittore eating salami. The interactive play could be hilariously interactive, even inviting the reader to add on, splice in all kinds of outrageous information. Ezines will be entirely interactive forms available on internet listservs, the World Wide Web or newsgroups. RJ :Yes, I know it is all technically possible, the things that you mention. But the computer-tools that the mail-artists have at hand normally aren’t up to it. An example is the TAM-Bulletin I tried to upload to the DDS-Unix server. I then found out that it doesn’t accept ‘extended ASCII-signs like : üüüéééééüüüüéé±ëéè (when you read this question, you will see what the computer has done to the signs), so on Internet I even have less possibilities at the moment compared to the BBS-services that I am used to work with. I still get this feeling that with Internet I’m back to basics as far as the E-mail is concerned. Internet surely needs some artists to change it. Maybe you can tell me a bit about the Telenetlink ’95? How is it going so far? CW :It’s a shame that you’re stuck with archaic protocol. Artists aren’t needed to change it, European politicians and businesses will be the ones to open the gates to Internet. As I’m writing this, European deregulation of telecommunication industries is ever nearer with preparation for full deregulation by 1998. French Telecom and Deutsche Telekom are planning an alliance with Sprint, a major U.S. long distance carrier. Italy’s Societa Finanziaria Telefonica per Azioni, otherwise known as STET, began talks with IBM last month (February 1995) in an alliance that could offer global internet connections to Europe. In the alliance with I.B.M. STET would provide specialized skills like transmission and switching. STET is also in the middle of a five billion dollar program to upgrade its lines with fiber glass cable technology needed for interactive television. This forthcoming deregulation in European communications is comparable to U.S. deregulation of the Bell System in the 1980s. It isn’t true that American mail artists lack necessary computer tools to participate in Internet. Your statement relates more to European mail artists than here, but exceptions definitely include Guy Bleus and Charles François. As far as basic e mail goes, H.R. Fricker, and Clemente Padin have joined the Telenetlink and today Jim Felter from Vancouver, British Columbia sent his first email Telenetlink message to me. Many mail artists are finally coming online partly because the Telenetlink has helped create a cyberspace community that has spread the original emailart lists since early 1991. Just got email today from Judith Hoffberg, Robert Ashworth, and Ramcell, all online mail artists. My current Telenetlink Emailart Directory lists over 200 participants. Albeit controversial, the Telenetlink has challenged the larger snail mail art community with a call for direct interaction rather than more congress talk. RJ :O.K. , lets talk about your book that just has come out. Tell a bit about the concept of it, and how it differs from your previous book. CW :Neither “Networking Currents” (1986) or Eternal Network: A Mail Art Anthology (1995) are scholarly histories of mail art, although EN was published by a university press and “Networking Currents” was self published by me. I am known in and outside of the network as a mail artist and not an art historian. Moreover, my purpose for editing EN wasn’t to add to previous historical surveys of mail art. In “Networking Currents” I discussed mail art subjects and issues with a pioneering focus upon the concept of networking and networkers. I have been told by some academic scholars that “Eternal Network Mail Art Anthology” is much akin to Robert Motherwell’s “Dada Painters & Poets.” That is, the EN anthology is more of an illustrated philosophy of mail art than a history book. I think it’s unfortunate that few major mail art books have surfaced in recent years. John Held’s “Mail Art Bibliography” is a librarian’s tool to accessing rare mail art sources. Winnes, Wohlrab, Jesch and Huber have recently produced “Mail Art Szene DDR 1975 1990,” a focused book about mail art behind the Berlin Wall. And Peter R. Meyer recently co edited a marvelous catalogue/book “Mailed Art in Uppsala: Choosing Your Partner.” But all of these books including my own edition have been written by active mail art “insiders.” This can be interpreted as a boon or bane depending on one’s viewpoint about what constitutes “authoritative texts.” It is possible that EN will be an important sourcebook that will open doors to others where doors were once locked shut. RJ :Besides the Telenetlink and your books you also used to make beautiful artistamps and handmade books. Do you still have time for that? CW:Yes, in fact I collaborated from 1992 94 in person and by mail with Marilyn Rosenberg, David Cole, and Sheril Cunning in the creation of “Spring Garden Mail Art Installation Bookwork”. 32 signatures were made with my handmade paper as a support for painting, drawing, printmaking, collage, and readymade objects. All four of us worked on all aspects of the bookwork , first in a workshop at my home and then for a year through the mail. Our installation will be on display at the University of Nebraska’s Museum of Nebraska Art through September of this year. Two months ago my handmade paper artworks (artistamps, etchings, and engravings) were displayed at Adirondack Community College in Queensbury, NY. I’ve been invited to exhibit my bookworks at Boise State University in November 1995 and also in Scarborough, New York. I prefer creating artwork by hand and now that my period of writing about mail art is over for awhile, I intend to focus more on handmade paper artistamps and/or painting and sculpture. My M.F.A. degree work was in studio art at Boston Museum School and my creations were whimsical stamp machines, three dimensional handmade paper stampworks and paper pulp paintings. I don’t have a lot of room now for large work so I expect I’ll scale down to stampworks again. I have a handmade paper mill in my studio and some small presses for making intaglio prints. RJ :It is funny you mention the fact that you don’t have a lot of room. Maybe this is the result of keeping all the mail-art you get. How is you ‘archive’ organized? CW:Yes, my archive takes up a lot of space on shelves, in cabinets, in bookcases, and fileboxes. Having an organized archive has saved me hours of time searching for materials, but what hours I’ve saved have been spent organizing the Eternal Network Archive and I’ve been doing such with a Hypercard database for over three years now. I’m proud of what I’ve accomplished, but the price has been a tremendous amount of time and energy. I have sections of my archive devoted to Mail Art Projects, 3 D objects, Mail Art Catalogues, Zines, Books, audio cassettes, posters, T Shirts, Videos, Artistamps (The International Register of Artistamps), The Networker Databank, and Fluxus related materials. Files from 1978 1991 include numerous materials collected from old correspondences with over 300 mail artists from fifty countries. Those materials sit in eight large fileboxes and in a crammed closet I haven’t reached yet. From 1991 to present I’ve assembled 145 catalogued folders, each folder representing a week of mail art. All of the items in these stuffed folders are recorded by the day, month, and year each arrived, ie materials arriving on May Day 1995 are tagged 050195. The database reflects this number and the last name of each sender. In an instant I can scan my files and tell you what mail I received on any day of the year, or I can reveal how much interaction I’ve had with other network friends. Why do I do it? As a child I was a compulsive stamp collector. I loved making books, saving correspondences and drawings. I’ve always been a packrat and I know many other mail artists with the same proclivity. But collecting isn’t my passion! I collect mail art because have an abiding belief that what we and our network mail art friends are doing is important art in the age we live in. That is, to give our works is a radical act. Nobody else in the mainstream does that because if they did it would undermine the entire commodity art system. I don’t create mail art to collect it. My biggest love is giving my work to others and collaborating with other artists. I stay on top of nearly all the mail art I get, so I’m never behind on the cataloguing. Last year I catalogued 1,500 pieces of mail art and I mailed out that much too. Sounds like lots, but I know of other mail artists who are more prolific that I. I spend too much money on mail art. Somewhere along the line I’ll decide to quit doing this librarian’s work. I’m an artist and this is my first love, not bookkeeping. So if it gets to be too much, I’ll stop. I’ll know when that time comes. My publisher tells me that in the creation of “Eternal Network Mail Art Anthology” they amassed a huge collection of ephemera, more than any other publication they’ve ever produced. From the investigations I’ve made about mail art archives, I’m certain that the Eternal Network Archive is the largest private catalogued mail art collection in the United States. The Networker Databank (in duplicate) collection alone includes over 2,000 networker congress items donated to the University of Iowa’s Alternative Traditions in the Contemporary Arts Archive, plus records mailed to the Museum of Modern Art in NYC. Because my space is limited, I’m selective about what I receive. I’m not very interested in picked over, rejected items that would have found their way into someone’s garbage bin. I do save, however, all mail art catalogues, videos, zines and artistamps that are donated to the Eternal Network Archive. RJ :How do you archive your electronic Mail? Do you just extract the ASCII-part and save this or do you also collect all the ‘bits and bytes’ that come along with it? CW:The electronic mail is filed (ASCII) on disk in chronological order by day, month, year, similar to the way I archive all my traditional mail art copy. RJ :You say you do save all mail art catalogues. What kind of catalogues do you like the most? CW:I like them all, really, but I certainly appreciate those with some effort and originality beyond the usual listing of names and addresses. Guy Bleus creates some of the most eloquent, beautiful mail art documentation in the network. His recent “In Memory of Ray Johnson” is a beautiful, lyrical work. Gianni Broi’s “La Posta in Gioco” (1990) is one of the most beautiful mail art show catalogues ever made, perhaps rivaled by Peter R. Meyer’s “Mailed Art in Uppsala” (1994). Andrej Tisma has a proclivity for creating wonderful mail art show documents too. His “Nature Gives” International Mail Art Exhibition Catalogue is a case in point. I have about 300 mail art catalogues in the Eternal Network Archive. But there are another 300 mail art project documents too, and I like these as well, if not better than the exhibition catalogues. Some of the projects I’ve grown to love over the years are Pawel Petasz’ works, Edguardo Vigo’s international stamp projects, and more recently Rea Nikonova’s superb “Double” assembling projects. I love Mail Art Assemblings like Pascal Lenoir’s “Mani Art,” Baroni’s “Arte Postale,” M.B. Corbett’s “Tensetendoned,” Dirk Frohlich’s Buchlabor assemblings, Bruno Pomney’s “Lola Fish” also and many others. RJ :Sometimes an organizer of a mail-art show makes a beautiful catalog and then offers it for sale to the participants. You surely know Lon Spiegelman’s views in the 80-ies, that “Mail art & money don’t mix”. What are your views? How are things in the 90-ies? CW:The death of Ray Johnson, January 13th, 1995 has proven that mail art and money make a nice honey pot. Ray’s early letters and postcards can go for $300,00 a piece. In the last 3 years as many as five dealers have been selling mail art archival materials. It is mail artists who sell the archives so I think Spiegelman’s ism is hardly a mail art altruism. A myth, perhaps. Italian painter Paolo Barrile invited mail artists to submit work to his “Earth Age Plastic Age” project and is now asking these participants to help pay for the catalogue book. I think that’s a cheap shot, paying for one’s book on the backs of those who submitted artwork that will be used. That’s not how I produced Eternal Network. All essayists received free copies. Eventually, those who sent artwork will get copies too. And it is very costly, we have given away nearly 20% of the edition!!! Maybe this is why so few publishers take on mail art books. Barrile wrote to me that, “I haven’t any publisher, any sponsor, bank, collector, gallery behind me. He claimed a thousand reasons, including his high blood pressure, for not being able to afford publishing. My question is simple, why didn’t Barrile just be honest in the beginning and tell mail artists they wouldn’t get a free copy in X-change for their work. Honesty can be respected but Barrile went about it all wrong. He is as bad as the art system that juries artists by slide, charging them to help finance the show, and then rejecting their work. I hate this form of chicanery and it is a big reason why I left the art system years ago! RJ :During this interview you managed to get you own homepages on the Internet and started the EMMA. In my eyes the homepages are a strange step in mail art. The sender is preparing something, but then the receiver has to reach out and get the homepages himself. The sending of information/graphics/etc. isn’t automatically there in homepages. The homepages look like a cybergallery but with a completely different access-level for all. What is the function of homepages for email-art? CW:Ruud, I don’t know how many homepages you’ve browsed on the World Wide Web, but I will have to tell you from my experience that the sending of information/graphics etc. IS there on World Wide Web homepages IF the homepage creator provides for such access. Conceptually, EMMA pokes fun at the idea of museums, and since she is an electronic museum there is certainly more to her than looking at a cybergallery. Home pages are powerful, interactive pages utilizing hypertext tags. Homepages on the World Wide Web require addresses as in traditional snail mail art. The World Wide Web homepage address is known as a URL (Uniform Resource Locator). Without a URL there can be no homepage. As in snailmail, the address is the art. Placing a homepage on the Web is also like posting a message except the website can also be an interactive mailbox whereby viewers are given a window to create and transmit email to the website artist. In one sense you could call a website mail art’s new hyper media post office where the community can once again gather to exchange ideas, debate, gossip, greet one another, and co create on visual and textual art projects. Sight and sound are now possible points for real time interaction on internet websites. Websites will be wonderful mail art resource centers for community access in the global village. I’ve created a cyberspace Artistamp Gallery as one of the rooms in EMMA and there I’ve posted an invitation to participate in “Cyberstamps,” mail art’s first exhibition on the World Wide Web. Artoposto has sent a stamp encoded as a GIF which I’ve decoded and placed in the Artistamp Gallery. Cyberstamps can be created on or offline, so I’m inviting all mail artists to contribute to the exhibition. It’s a great way to have your artwork shown to a huge international online audience. So send your stamps to Cyberstamps, PO Box 370, Etna, NH 03750, or as GIFS via email to Cathryn.L.Welch@dartmouth.edu. Deadline will be November 1, 1995. Oh yes, not having a computer isn’t an excuse for not entering! RJ :I’m also very much interested in statistics. Could you tell me how much E-mail, snail-mail & visitors to your homepages you got in June. Which percentage of the mail did you answer or will you finally be able to answer? CW:Like you, I get a lot of junk emailart. I’d say roughly the same amount of worthless, thoughtless junk I get in the postal mailstream. I just don’t have time to answer anything that doesn’t show creative initiative, curiosity, or genuine person to person warmth and interaction. I love getting correspondence art, but so few send it. So what do I do with stuff I can’t or won’t answer? I put it in the trash can by my desk or the trash can icon on my PC. How many visit me via email as a result of the Electronic Museum of Mail Art on the World Wide Web? There’s a way to tell at Dartmouth College, but I haven’t had time to check. When I arranged a website at Arleen Schloss’ May 20th exhibition at A’s Gallery (SoHo, NYC), “Hommage to Ray Johnson.” Judith Hoffberg emailed me that she helped many in attendance access my website “Tribute to Ray Johnson.” This emailart exhibition is still posted on the World Wide Web at the Emailart Gallery: http://mmm.dartmouth.edu/pages/user/cjkid/EmailartGallery. Back to your question. I’d say I get ten emailart messages a day. Many contacts are in response to my website, my mail art edition “Eternal Network,” or to my own queries in cyberspace. In comparison, I get about six or seven pieces of snail mail each day. Today I got eight pieces of snail mail, half from Europe. I gotta tell ya, I can’t continue to pay the current postage rates. Just last week the United States Postal System hiked their overseas airmail rates from 50 cents per half oz. to 60 cents. Rates to Canada changed from 40 cents per half oz. to 46 cents. The cost of a postcard to Canada jumped up 25% from 30 cents a card to 40 cents. This makes my emailart a very competitive second choice to mail art. Hey, I’ve got a new “Netshaker Online” ready for you. The current issue is about Clemente Padin’s work bringing Telenetlink to South America. Maybe I’ll have that issue to you by tonight. Just read your “Mail Interview With Rod Summers” and found one of your questions rather strange. You stated, “Last year Crackerjack Kid tried to start the TELENETLINK 95 project. I”m not sure if it really started or not. I was surprised by the question because obviously during the months that have elapsed in this interview, you’ve known all about Telenetlink. You have told me and written many times in your publications that you are a participant in the Networker Telenetlink 95. Are you, and if so, how are you helping to bring the Telenetlink concepts to the European mail art community? Also, when are you going to send me a “cyberstamp” GIF for Mail Art’s first online mail art exhibition? RJ :Well, I will answer you questions by separate mail, but here is my next question for you. I know that some mail-artists sold or traded their mail-art archive to the postal museums. Do you think this is a good thing to do? CW:I hadn’t heard about mail art archives purchased by postal museums. What parties are you referring to? Without knowing the names or reasons for those mail artists who are selling/trading their personal archives, I can’t make a judgment as to whether such activities are good or bad. I suppose there isn’t much I can do if you wanted to destroy your own archive. There have been mail artists who have performed such acts. I once had a girlfriend I wrote to while I served in Vietnam. When I came home we dated awhile and months later broke up. Then years later I asked if she would xerox certain of my letters containing poems and drawings. She replied that her ex husband in a fit of jealousy burned every letter I ever mailed. I was outraged and felt that an old sacred bond had been violated by a stranger. Don’t you think that letters and art are gifts of the heart? I guess there’s always the risk that some mail artists are not above ripping your heart out. Ray Johnson called last year complaining that other mail artists were selling his postcards for up to $300.00 each. He said, “They can’t do that, I want to stop it from happening.” I said, “You have two choices, 1) start placing copyright notices with each work, or 2) stop mailing art” What is left of mail art when it becomes a copyright? Where is the cutting edge at that point? You have the right to sell my “gifts” if that is your objective, but anyone doing such is going to have trouble maintaining connections in the network. As you know, word gets out fast in the network. Of course, if you drop out of the network, what others think may not matter to you at all. I know a lot of mail artists who feel they have earned the right to sell their archives. Most everything in an archive was acquired through a great amount of personal cost in time, energy and finances. I’m certain, for example, there are some mail artists who are holding their archives like an IRA retirement account. RJ :What will be the future of your archive? CW:I have given away The Networker Databank to the University of Iowa’s “Alternative Traditions in the Contemporary Arts Archive” but I will continue to maintain the Eternal Network Archive as long as I’m involved in mail art. At present it is the largest catalogued mail art archive in North America. As such, I hope it will become an important center for study and research to anyone interested in the role of the networker. RJ :Well, I guess it’s now time to end this interview. Maybe there is something I forgot to ask you? CW:Hey Ruud, you’ve got so many questions and I’ve got to go change the triplet’s diapers. I s’pose that’s a good enough reason to end the talk. Good luck with all your other interviews in netland and I hope other mail artists will appreciate the hard work you’re doing. I do. See you in the mailstreams (cyberspace & mail artdom). RJ :Thanks for the interview!